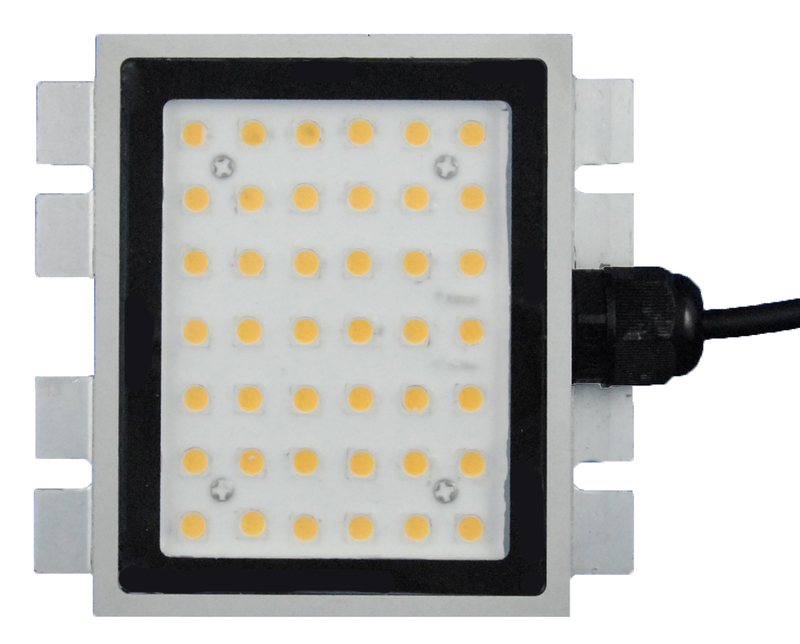 03.21.2012 – Los Angeles, CA – American Illumination’s newest 4×4 Mega Blockz LED module is perfect for commercial indoor or outdoor applications where high lumen output and low energy use is required. It uses ultra-bright yet low power LEDs and packs a punch with an output of over 800 lumens. The Mega Blockz is incredibly bright given that it is only sixteen inches square (4”x4”) in size. Building owners, architects, engineers and facility managers will appreciate the Mega Blockz because it exceeds the minimum 70 lm/w Energy Star efficacy requirement for solid state lighting. Mega Blockz is the cornerstone to a designer’s palate of fixtures. It is perfect for both interior and exterior installations; the 4×4 Mega Blockz can be incorporated into sconces, indirect light sources such as hanging pendants, and some ceiling fixtures featuring a wide beam spread. Outdoors, it can be used in up lights, brick lights, signage or back lights, and general exterior lighting. High lumens, terrific light output too! • It emits about the equivalent of a 60 watt incandescent light bulb at minimum. This equals to over 800 lumens at Warm White (2700K) while consuming only 10.3W. Efficacy exceeds 70 lumens per watt! • At 4000K natural white, its efficacy is at 88 lumens per watt. • The square array creates a directional beam angle over 100 degrees. • It is dimmable and durable with a solid finned aluminum housing for excellent thermal management. • Mega Blockz is approximately 4″ x 4″ x 7/8″ dimensions – perfect to install in linear surfaces as a wall pack. • No additional heat sink required! • The module is securely potted and perfectly sealed for moist or damp environments. • Sturdy tabs make it easy to mount for secure placement. Customized mounting is available upon request. American Illumination, Inc.® specializes in the design and manufacturing of LED light engines, retrofits, LED light fixtures, and beyond. With extensive knowledge in LED technology and expertise in engineering and manufacturing, the firm offers custom design solutions for OEM companies in search of a unique LED lamp and fixtures.